When a country engages in industrial warfare, it does so in two steps. First, it needs to establish its military and economic defenses. After it has systems in place to defend its own interests, it begins to attack industrially. The industrial attack uses the manufacturing industry as its primary strike tool to invade territories and replace their manufacturing transactions with its own. The goal for the hostile nation is to become rich by seizing the economies of its opponents and, through this control, force its opponents to abide by its demands. To be efficient in an industrial battle, a nation must be nimble on its feet. This nimbleness gives it the ability to absorb blows from its competitors, and also to withstand difficult economic environments of recession and depression. To move products and seize markets, it needs to keep prices low while maintaining efficiency in its transactions. Those that withstand can undercut their competition, put opponents out of business, then prosper only after gaining control of the market. The Chinese regime has been engaging in this sort of economic war for at least the last two decades. It studied the American corporate model and began to create an environment to entice American corporations to outsource their manufacturing to China, starting with smaller items such as nuts, bolts, toys, and shoes. The low-cost manufacturing caught the attention of American corporations, which saw results on their balance sheets that contributed to the bottom line and fed the interests of shareholders. Soon, corporations in the United States and Europe were giving more and more of their products to Chinese factories, until eventually they were having their entire products built in China. Alongside this, shareholder growth was satisfied, and employee growth was cut. As this situation advanced, the American market was squeezed into a bad set of economic conditions set by China. In order to compete with pricing, companies had to consider China’s cheaper manufacturing and follow this model. Thus, the transactions that America had carried so proudly since World War II were killed by the loss of employees, as their jobs were sold to fulfill the needs of the shareholders. As a result, the American workforce was laid off and sold out. Once the Chinese regime knew it had an effective defensive construct, in terms of industrial warfare, it began to accelerate its model. 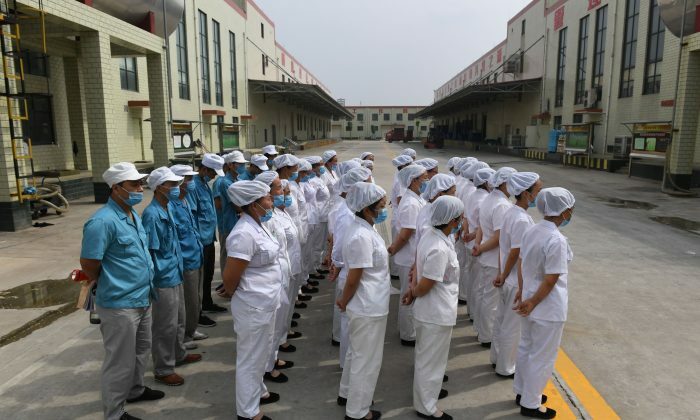 Fueled by state programs of economic theft, Chinese companies began to more aggressively copy American products, innovation styles, management structures, training systems, and others to replicate everything that had kept American companies ahead of their competitors. The Chinese companies not only did this to the United States, but also launched similar programs of theft, copying, and industrial attack in countries throughout the world. This resulted in a powerhouse economy in China that played by its own rules and could force its competitors to follow a different set of rules. In its push for effectiveness, the Chinese regime is trying to move its own products into foreign markets. Thus, as the West has actively helped produce products in China for its own shareholder bottom line, China has been trying to gain access to the American consumer, and it has done so by placing its products in major American stores. Among these companies is Wal-Mart, and China has used the retailer as a place where its products can be picked up, examined, and purchased by consumers. The prevalence of low-cost Chinese-made products means that the retailer is perceived as having lower prices than its competitors, and so other retailers have been forced to also sell Chinese products to compete. This led to a flow of American retailers going to China in search of the cheapest deals possible, in a bid to serve their bottom lines and fulfil the retailer-shareholder culture. Through this method, the same battle for pricing that the Chinese regime used to overtake manufacturers was also waged on American retailers. As this took place, the ingrained culture of selling the bottom to feed the top began killing off the American workforce. The Chinese regime wasn’t just doing this to Americans either—it was using similar tactics in India, Japan, South Korea, Europe, and everywhere else it had targeted for industrial dominance. Manufacturers and retailers gladly and readily accepted the offer of cheap Chinese products, while the invasion of Chinese industry took a devastating toll on indigenous manufacturers for the simple fact that they could not compete. For every retailer that stood up and said “buy American, sell American,” there were many others that said “buy Chinese, sell American.” When you have an industrial warfare fighting stance such as this, it becomes much more difficult to win against an opponent, as the battle has already reached into your own territory. When it reached this stage, U.S. companies were not just fighting China; they were now also fighting Americans and the activities that were driving the sale of Chinese products: American supply and American demand. The industrial battle had thus been transferred into the heartland of the United States, and Americans knew this and came to accept it. Many were even encouraging and complementing this process by financing the growth of China. This was not merely an economic push, either. Economy feeds military, and this is even more so for the Chinese regime, which gives little space between public and private, and which forces its companies to serve the interests of the state. The more the Chinese Communist Party wins in industrial warfare, the more it reinforces its military capabilities, which are given additional strength by the prevalence of factories and raw materials from its economic wars and are fed by the same programs it uses to steal foreign intellectual property and innovation. This makes the prospect of a kinetic war riskier and more dangerous. Amar Manzoor is author of the book “The Art of Industrial Warfare” and founder of the 7Tao industrial warfare system.